Massaro Community Farm is a nonprofit, certified organic farm on 57 acres of land deeded to the Town of Woodbridge in 2007 by the Massaro Family, who had farmed the land since 1916. Our farm operation serves a 200-member CSA and has a weekly presence at area farmer’s markets. The farm includes ~42 acres of woods and wetlands along with 15 acres of fields, with 10 acres currently cultivated producing fruit, vegetables, flowers, and honey. Massaro’s organic vegetables complement dishes at area restaurants such as Heirloom, Miya’s Sushi, Olmo, and Zinc Modern American Kitchen. Massaro Community Farm strives to act as a good steward of the beautiful farmland and surrounding environment we have been entrusted with. Aside from growing our vegetables and fruit under strict organic standards, our land conservation practices include composting, a five-kilowatt solar photovoltaic system, hiring local labor, and whenever possible, utilizing wood taken from our property and milled by our neighbor, Trevor Youngberg, for farm construction. We collaborate with local Girl Scout and Boy Scout troops on numerous farm projects. 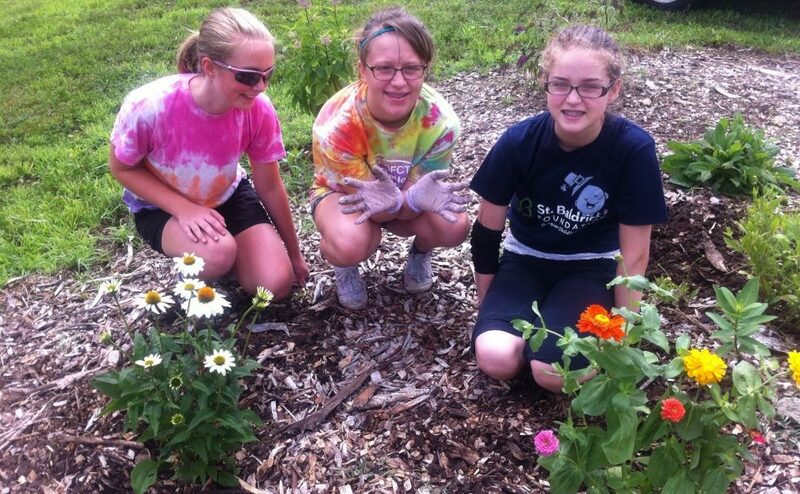 Here Girl Scouts installed a butterfly garden at the farm. Each year, Massaro Community Farm donates at least 10% of our diverse vegetable crops to local hunger relief agencies. We donated more than 5,000 pounds of produce in 2018, and more than 60,000 pounds of food since 2010. The annual amount donated can vary depending on farm conditions. Our food donation partners have included BH Care (Ansonia), Columbus House (New Haven), CT Food Bank (East Haven), FISH New Haven, Jewish Family Services (New Haven), Master’s Table Meals (Ansonia), Salvation Army (Ansonia), Spooner House (Shelton), and Woodbridge Human Services. You can read more about our food donations and other key performance metrics in our most recent Annual Report. The farm is open space to be explored and enjoyed by all. Our nature trail meanders for two miles through the woods and wetlands behind our growing fields. At Celebrate Spring, we sell flowers and organic vegetable seedlings coupled with gardening instruction. Dinner on the Farm engages the senses through a farm-to-table meal served right in our fields. We also provide a number of educational programs throughout the year, including Summer Camp on the Farm, film screenings, beekeeping, and other sustainability workshops. Massaro collaborates with numerous other community organizations to share our passion for locally grown food, thoughtful land stewardship, and education. Our mission is to enhance quality of life for generations to come by engaging the community in a range of farm-based activities. Our board operates under the guidance of an overall strategic plan, which it revisits each year in connection with its annual planning and budgeting processes. The board welcomes input by the community in what takes place on the farm. Interested residents are welcome to call the farm office (203-736-8618) to speak with staff or board members at any time with suggestions or comments. The farm also encourages involvement in planning and execution of farming and education. Interested members of the community can serve on a variety of committees to help carry out the vision and mission of the farm. In 1916, John and Mary Massaro purchased over 100 acres on the border of Woodbridge and Ansonia. They grew grapes to make wine, hay and corn to feed the dairy cows and chickens, and fruits and vegetables to nourish themselves. When John Massaro died on a snowy Christmas Eve in 1947, two of the three sons, Tony and John, suddenly had to run the farm with only their mother’s help. They continued in their father’s footsteps and kept the farm running. After son, Louis, moved West, neither Tony nor John Jr. ever married. With no children of their own, they created their own extended family by recruiting local teenagers to work on the farm. This hands-on experience with thousands of chickens and dozens of dairy cows left a lasting impression on each person who contributed to the Massaro farm effort. When John Jr. passed away in 2007, the family farm was entrusted to the Town of Woodbridge for safekeeping. In the autumn of 2008, the nonprofit Massaro Community Farm was formed to restore the farm with minimal burden on town taxpayers. 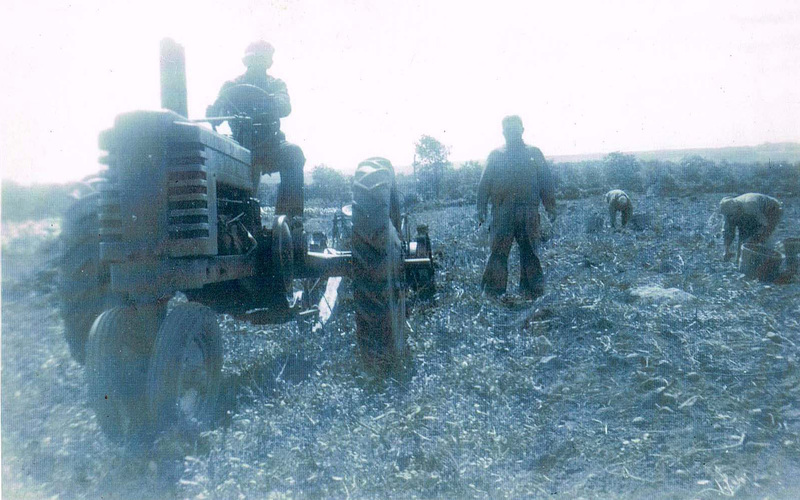 John Jr. (on tractor) and Tony (on right) in the fields circa 1940s. Throughout the years of financial hardship, the Massaro brothers worked hard to ensure their farm survived. Massaro Community Farm, Inc. is committed to continuing their dedication and hard work.